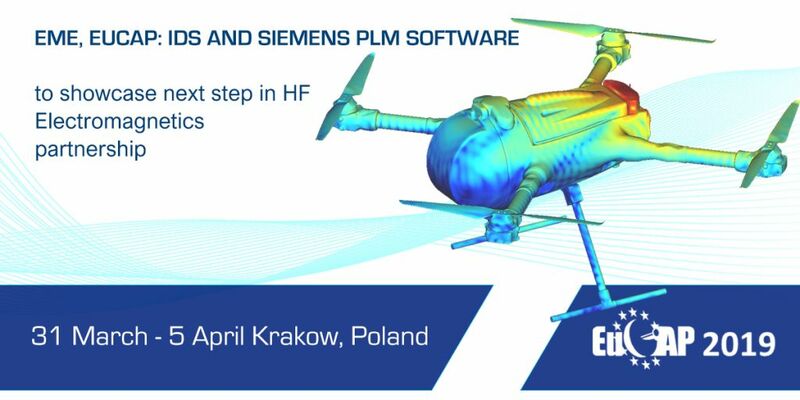 IDS and Siemens PLM Software will be attending the European Conference on Antennas and Propagation – EuCAP 2019 in Poland, ICE Krakow Congress Centre, from 31 March to 5 April. Communication systems (5G, WiFi and Bluetooth). Electromagnetic modelling through Simcenter™ 3D CAE tools (expanding Galileo Suite IDS CAE products). The unique IDS – Siemens PLM Software approach to EM Engineering integrates into an optimized process devised from the synergies between virtual testing, via EM modeling and simulation, and physical testing/verification, through electromagnetic measurement. To demonstrate the effectiveness of the combined usage of IDS and Siemens PLM Software technologies in the product development, the IDS ElectroMagnetic Engineering Division will showcase its DronEM product, a micro UAV developed by IDS (IA-3 Colibrì) fully configured with an EM sensor and the related software to measure electromagnetic fields and process and visualize acquired data.